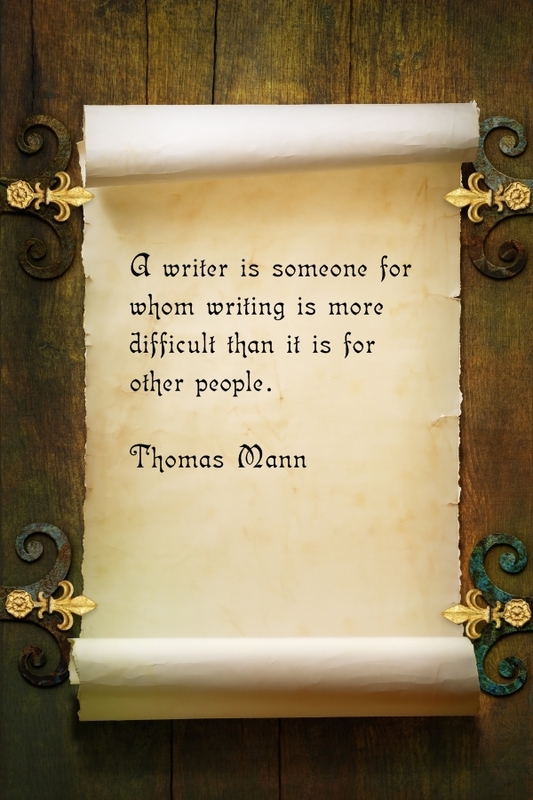 I think I may have misunderstood the quote but what I got from it was, that it is more difficult for writers because they do it more and so it increases the amount of times that they have a possibility for it to be hard. That’s not how it is for me. As a writer, I study the craft, and I have learned a great deal about the techniques. Add that to a passion for perfection, and the writing becomes far more difficult. I think about every sentence, every word, and how each technique can be applied to every paragraph. The more I learn, the harder writing becomes. I love it. I have a passion for it. I want it to be perfect. Since I know much more about what writing perfection is, I have to labor that much harder to achieve that higher standard. Very true! It reminds me of the second novel I ever wrote–at the time, I thought it was fabulous. Tight writing, great characters, engaging plot . . . But now I see that the writing is weak, the characters inconsistent, and the plot riddled with holes. XD I’ve learned so much since then that rewriting this book will be a lot harder than drafting it was. Oh, from that angle I completely understand and would agree, especially because I am a perfectionist in all areas, but it comes out all the more in areas that I specialize in, such as IT security. Also, my reply was supposed to be to your reply, not another reply.